Superb quality over wireless as never experienced before. Great quality when compared to other wireless headphone brands. Extremely comfortable fit for almost everyone. A little low on the bass thump. The volume controls can be a little hard to use. If you used to hate wireless headphones because they could never offer the quality of a wired headset, the Sennheiser RS 160 has been built for you. 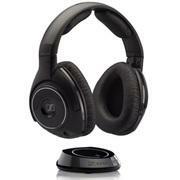 Within a range of 20m, this headphone will give superb audio quality to rival the best corded headphones out there. The latest technology gives you the best in sound quality. The problem with most wireless headphones today is the fact that they use FM to transmit the audio from the transmitter to the headphones, which means that you can experience a lot of static or hissing if there is interference in the atmosphere you are using the headphones in. Sennheiser, however, has incorporated the latest in wireless transmission technology known as Kleer in to their headphones, and the RS 160 is the cheapest of the lot at around $140. This is a great headphone set which provides crystal clear sound within the range of 20m which is the maximum range of transmission for the Kleer microchips. The Sennheiser RS 160 fits snugly on your head no matter what your size is. In addition, the headphones contain a set of volume control buttons as well as a microphone jack. The 2 AAA batteries, once recharged, will keep the headphones running for about 24 hours. The transmitter also contains a power switch to help conserve power when you are not using the headphones. The Sennheiser RS 160 is a great choice if you're looking for wireless headphones which will not force you to compromise audio quality.